We offer inventory scales for large weighing jobs, along with several other industrial scale products. Check our products and view an extensive selection of industrial scales, animal scales, and custom scales to suit any need. Inventory control scales include counting scales, high precision scales, high capacity crane scales and livestock scales, such as our Automated Pig Sorting system. With each of our scales, the option of automated weight data collection may be added. 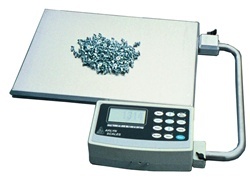 Make inventory control an easy process with our weighing devices. Automate weight data collection with several options, including Ethernet connectivity, USB port, and data logging features. Import weight data into applications with specialized software. We are in touch with the needs of our customers. Just let us know how we may create a weighing solution for you. We offer Industrial Bench Scales at a price well below competitors. The Standard 6200 scales implement top of the line strain gauge technology, along with load cells made of stainless steel for durability and accuracy. For those who require a higher level of accuracy, the 2x Double Accuracy scales are built for optimized performance with a small increase in price over the Standard 6200 model. We always provide customers with a high-quality product at a lower price than our competitors. From supersensitive High-Resolution Scales to Ultra Precision Scales with Super Sensitivity and Surface Acoustic Wave (SAW) technology, our high performance weighing instruments are created for those industrial jobs that require a high level of precision and accuracy. Corrosion Resistant scales accurately and effectively measure drums and cylinders containing corrosive materials without damaging the weighing instrument. Scales to weigh drums, such as the Industrial Drum Scale with Ramp and Stainless Steel Cells is a great choice for weighing large cylinders and drums that contain liquids, gas or solids. High capacity crane scales effectively measure a hanging load and our rain gauge scales are protected with an encased power supply. Scales for any industrial use, as well as digital indicators and software, may be found at Arlyn Scales. New to our product line, wheelchair scales are now available for accurate, precise weighing of all sizes and types of wheelchairs. A 30×32 inch platform accommodates most chairs, and these scales have a capacity of up to 800 lbs. Ramps are constructed into both sides of the platform for easy mounting and dismounting the scales. Arlyn wheelchair scales also feature the Average Weight and Hold technology and are shipped with a standard non-slip rubber mat. Our wheelchair scales are Bluetooth enabled through USB and Ethernet connectivity are also available for data collection. We also produce a complete line of counting scales. Count industrial parts quickly and easily with the Quick Count feature on our counting scales. Automatic calibration requires no setup or service. Counting is a key task for many industries; let’s look at the process more closely. When it comes to saving time and reducing labor costs in regard to inventory, nothing is as helpful as a scale that will count small parts for you. Counting by hand is tedious, inefficient and exceptionally prone to human error. A counting scale can effectively determine the number of parts in a large sample of identical pieces by weighing the sample and dividing it by the number of individual parts. Yet not all counting scales are created equal. The most common cause of inaccuracies is a complicated sample weighing process. A lot of manufacturers get this wrong. And if you’re using one of their scales, your inventory counts can be wrong too. In order to accurately count the number of parts in your inventory, the particular sample size must be weighed precisely. The scale will then use the sample weight and size to determine the total number of parts. Simply choose your sample size—either 10, 25, 50 or 100 pieces—from the digital indicator and place that number of items on the platform. The scale will create the sample and automatically switch to counting mode where you can continue to count the same part. Just keep in mind that the more pieces you use in the sample, the more accurate your sample (and entire inventory count) will be. This is especially important if the individual weight of identical parts has a tendency to differ. The more parts you use in the sample, the better your scale will be able to account for these slight differences. This feature has the advantage of being extremely fast when you need an immediate count. The only downside is that you won’t be able to save the part data and sample weight in the scale’s memory. If you need to count this part again in the future, you’ll have to go through the sampling process again. The sampling process can be a bit time consuming since you have to hand-count the pieces included in the sample. To bypass this process in the future, you’ll want to name and save the sample weight according to the part through the PARTS COUNTING menu on the digital indicator. Add a new sample. Navigate to NEW on the menu and press enter. The default sample name will be a 4-digit number determined by the number of samples already in the scale’s memory. Edit a sample. Edit the description and/or weight value of a sample. Weight values can be entered manually by the operator or automatically using the scale platform. Delete a sample. If you’ll no longer stock certain parts or feel you made an error, removing the entry is simple. Activate a sample. Use this feature when a sample weight has already been stored for the part you’re counting. Simply choose the sample you want, click the ACTV function, press enter and place the parts on the platform. If you have identical parts in different containers or their total weight exceeds your scale’s capacity, this function will allow you to keep a running count that can be completed in one sitting. Simply choose the sample weight you want to use and press the ACCUM key. The scale will then aggregate the weight of each batch until you press and hold the ACCUM key, which will exit the accumulate function and give you the total number of pieces. Let’s say you have a regular scale with a 100 lb. capacity and a resolution of 0.02 lb. You use a sample size of 10 pieces and the weight of an individual piece is 0.08071 lb. Your sample weight should be 0.8071 lb. However, your scale will only read to its best resolution, which is 0.02 lb. So your scale would actually display 0.81 lb. That’s an error of 2.5%, which is pretty significant. An error that high can actually affect the accuracy of your entire inventory for this part. Arlyn Ultra Precision Scales are driven by our internationally patented Surface Acoustic Wave (SAW) technology, which offers the same or better accuracy than a force motor scale at a cost more comparable to a quality strain gage scale. If you had a SAW-C scale from Arlyn, you would have the same 100 lb. capacity, but you’d also have a much finer resolution of 0.001 lb. If we use the same piece weight (0.08071 lb. and 10 pieces), your sample weight would still be 0.8071 lb. Yet your scale would be able to read to 0.807 lb., which reduces the error from 2.5% to 0.03%, which is so small that it will not affect your inventory count in any way. Our Animal Scales are perfect for the veterinarian’s office, where larger animals may be conveniently and comfortably weighed. Veterinary scales, with a lightweight yet sturdy build, are perfect for weighing house pets or livestock. Select a capacity up to 500 lbs. or as low as 50 lbs. With a welded aluminum frame and stainless steel load cells, this lightweight vet scale is easy to ship and move. A non-slip rubber mat is included for the comfort of the animal. Our Animal Scales includes a three-year warranty for parts and labor in three model types: The 620-Vet is great for measuring small animals, such as birds and reptiles. The 320-Vet is built for measuring larger animals and livestock. These scales include an Average Weight and Hold feature that will capture the average weight of the animal, and secure that weight on the indicator, even if the animal moves around on the scale. The Combo-Vet combines the features of the 620-Vet and the 320-Vet for an all-in-one weighing solution. The platform sizes for the Combo-Vet are 22″ x 44″ and the 12″ x 16″. Our Vet Scales are water resistant and have a large, easy to read digital display. We also carry a line of large livestock scales, such as the Alpaca and Llama scales and the Automated Pig Sorter. Our Livestock, Alpaca and Llama scales are very low-profile and are water resistant, like the smaller Vet scales. A large digital display shows weight numbers that are one full inch high. The display is mounted on a swivel device which allows viewing from any angle. The Smart Sort automated pig sorter includes a USB port for saving weight data to a USB drive, RFID ear tag reading capability, and a color touch-screen with a menu-driven controller. With the most animal-friendly design of any pig sorter on the market, our automated pig sorter is rugged, yet easy to use. The pig sorter is constructed of heavy gauge tubular stainless steel with open frame design. We will work closely with any business or industry to develop scales that are customized to meet very specific needs. From scales with 2 lb. to 20,000 lb. capacity, all of our products are constructed with the highest quality materials. Rugged stainless steel load cells ensure precision, yet are tough enough to withstand extreme use. We also develop specialized software that will import your weighing data into spreadsheets, databases or even other PC-based applications. Contact us to learn more about how we may develop a custom solution for your weighing needs. Inventory data is meant to be shared. For data storage and transfer, our inventory scales all the user to choose from a variety of communication options including USB, flash drive, WiFi, Cloud, Ethernet, RS-232 and more. If you’re ready to try one of our scales, we’ve eliminated the middlemen who increase the price of the scale simply because they’re part of the chain between you and the factory. When you work with Arlyn Scales, you work directly with the factory. You get competitive prices on higher quality products. When you opt for a custom system, you work with the team that will design and fabricate it for you. You get real answers and solutions. Contact us to learn more about our extensive line of weighing devices. Find out why we are the best and what Arlyn Scales is able to do for your business.